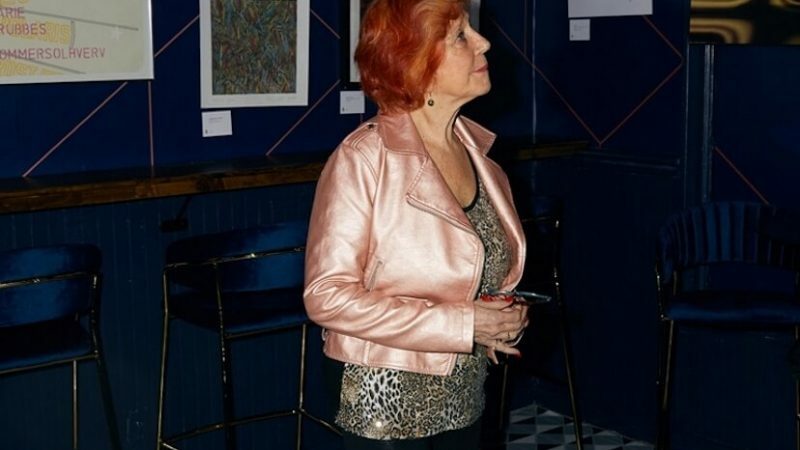 Kingston resident Yvonne Sewall works to make sure artists are treated with respect. In the 1960s and 70s, Max’s Kansas City was New York City’s most buzzworthy nightspot, drawing an eclectic, electric crowd of stars, creatives, and counterculture celebrities. Restaurant owner Mickey Ruskin prized creativity and wanted the city’s artists to think of Max’s as a second home. It’s that legacy that today inspires Kingston resident Yvonne Sewall to help artists through the Max’s Kansas City Project. As well as feeding artists, Ruskin offered them a tab in exchange for their artwork, some of which he displayed in the restaurant. Emerging artists had a place to showcase their work and the tab provided a way to entertain agents and gallery owners, helping to catapult some art careers. Actress Jane Fonda and singers David Bowie, Iggy Pop, and Bruce Springsteen are just a few of the celebrities that frequented Max’s before it finally closed in 1981. Ruskin, who left Max’s in 1975, opened more venues, including the bar/restaurant nicknamed One U in Greenwich Village. He died shortly thereafter, at the age of 50, in 1983. Since then Sewall has worked to protect the artistic legacy of Max’s. In 2001 she received 501(c)(3) status for the Max’s Kansas City Project, which helps artists in need. The project provides emergency funding and resources to pay for housing, medical and legal aid, with one-time grants of between $500 and $1,000. An artist can work hard, said Sewall, and achieve success, then suddenly be sidetracked by something insurmountable. Sewall also refers artists to other sources of financial assistance. The project is funded through donations, fundraising events, and by the sale of art created and donated by Max’s alumni, with prices ranging from $75 to $7500. Ideally, Sewall would like to see the collection housed in a museum that will dedicate a room to the notable pop culture hub. In February, the project’s current art collection and a recreation of Max’s interior was temporarily displayed at Los Angeles’s first annual Frieze Art Fair at Paramount Pictures Studios. The pop-up exhibit, created in partnership with Bombay Sapphire, included work by conceptual artist Lawrence Weiner and Anton Perich, a Max’s busboy-turned-photographer. Yvonne Sewall’s 1998 book looking inside the legendary happenings of Max’s Kansas City Project. As well as helping artists, Sewall has been developing a Fearless Youth program to offer teens resources to counter substance abuse and suicide, as well as recommending the arts as a creative outlet. Sewall wrote the book High on Rebellion and recently began a Drop Into Max’s podcast, in association with Woodstock Radio, as a way to share the venue’s pop culture history. She is also developing a documentary about Max’s. In the 1960s and 70s, transsexual icons such as Candy Darling and Holly Woodlawn faced overt discrimination in more conventional venues. The Warhol superstars were not only welcome at Max’s but often socialized gregariously in the VIP back room with the likes of filmmaker Federico Fellini or Rolling Stone Mick Jagger. Treating artists with dignity and respect is a legacy that Sewall’s charity aims to continue.